The key materials used in our fins are carbon-fiber and epoxy resin. The epoxy used is a high strength type that has excellent dynamic properties and sufficient temperature stability for the fin-application. It is cured under high temperature during the pressing process. Afterwards the blades are tempered in a controlled ramp-up, hold and ramp–down cycle. The carbon fiber is protected by a green In-Mold-Coating (IMC). Why? 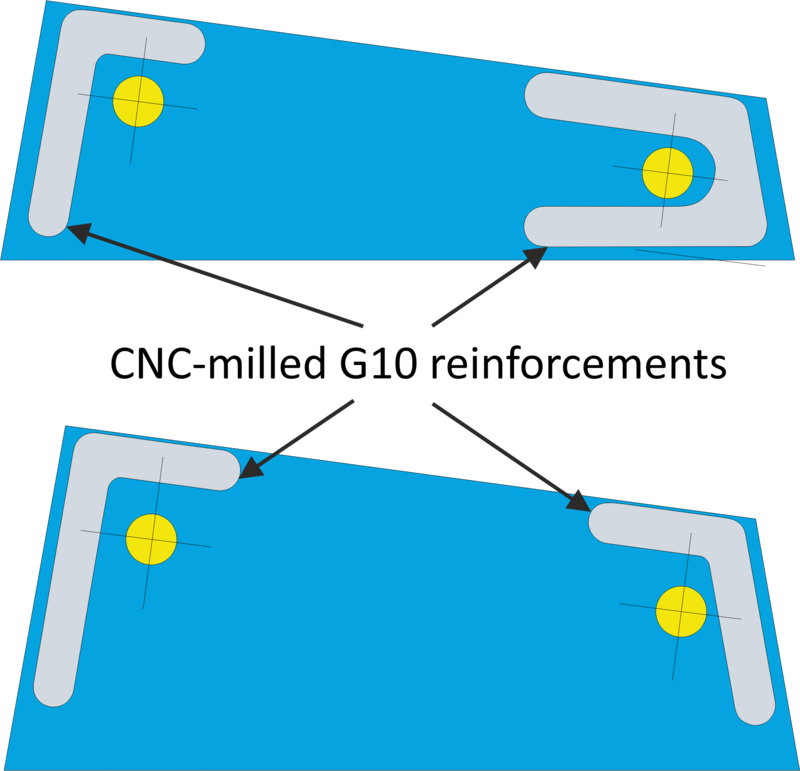 A fin with a non-polished, slightly roughened surface has a more stable boundary layer with delayed flow separation than a fin with a polished surface. That’s the reason why we are roughening the surface although the fin comes out of the mold nearly polished. 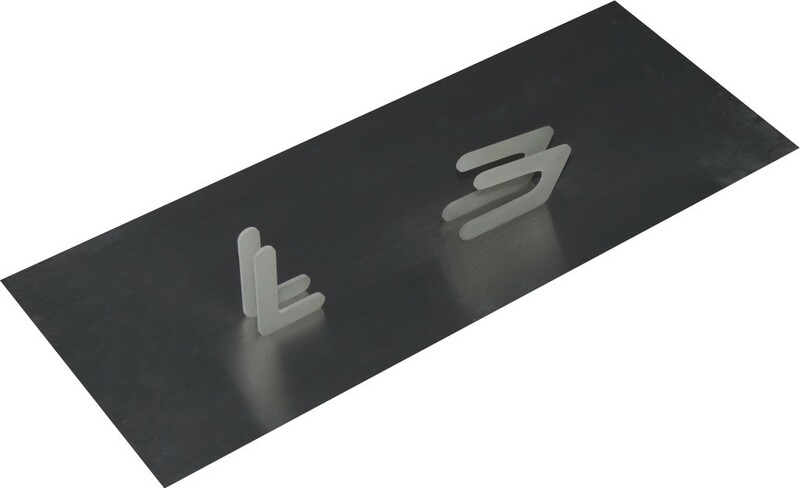 We apply a roughing depth of 80-120µm on each side of the fin. Therefore we need at least a gel-coat or IMC (independent if it’s clear or colored) to not sand into the carbon structure causing a first damage weakening the fin. Of course the IMC is applied inside the mold as a very first, thin layer before the carbon sheets are laminated. That guarantees very small tolerances of the profile after roughening. We use a colored IMC to guarantee that the carbon structure is not damaged over lifetime by UV-rays and that the fin stays cooler when it is exposed to the sun. This is quite important for all softer and longer fins because the amount of interlaminar shear forces gets quite high causing a significant risk of delamination. 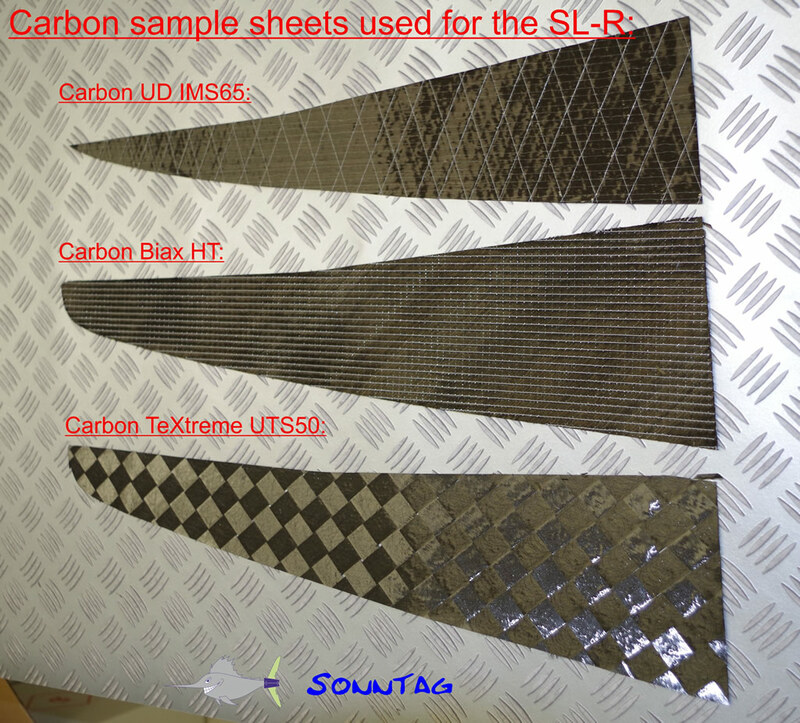 We use carbon fiber with different fiber types and orientations. The carbon fabrics used are produced according to our material specification and made out of high-end carbon filaments (i.e. IMS65); this allows us to design unique fin characteristics without risks of breakages. An important factor is the dimensional accuracy of the single carbon fiber sheets. We cut each carbon sheets with CNC-milled templates and always precisely with the defined fiber angle. 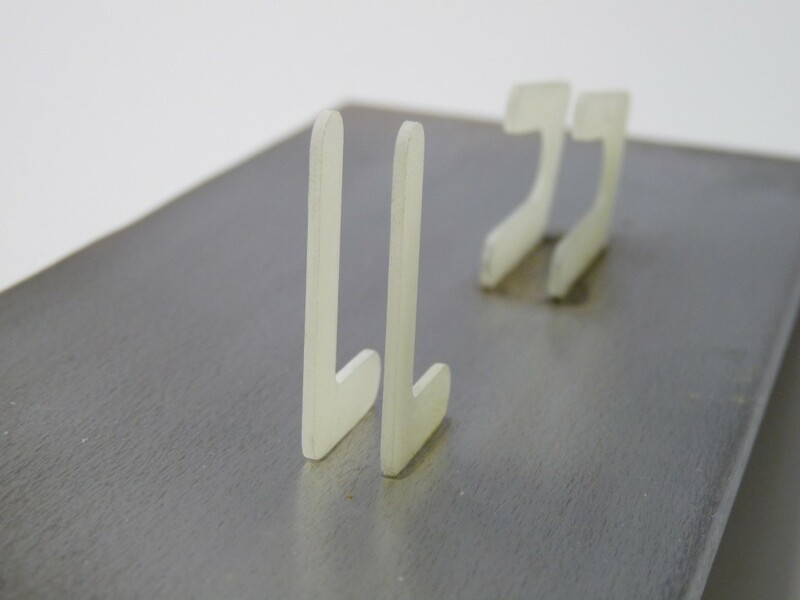 Together with a standardized production process we are able to produce fins with very small tolerances in bending and torsional stiffness. Our fin-bases (Tuttle, Deep Tuttle) are made out of an impact-proofed material that is reinforced by CNC-milled G10-elements. These G10-elements are especially designed for protecting the areas around the drilled holes of breakage when higher forces are applied to the inserts by the screws. In overload conditions, i.e. crashing with 60km/h with the fin onto a solid rock, it often happens that the box in the board and/or the board itself is damaged causing very expensive repairs. Often water can go into the board making the repair not easy. 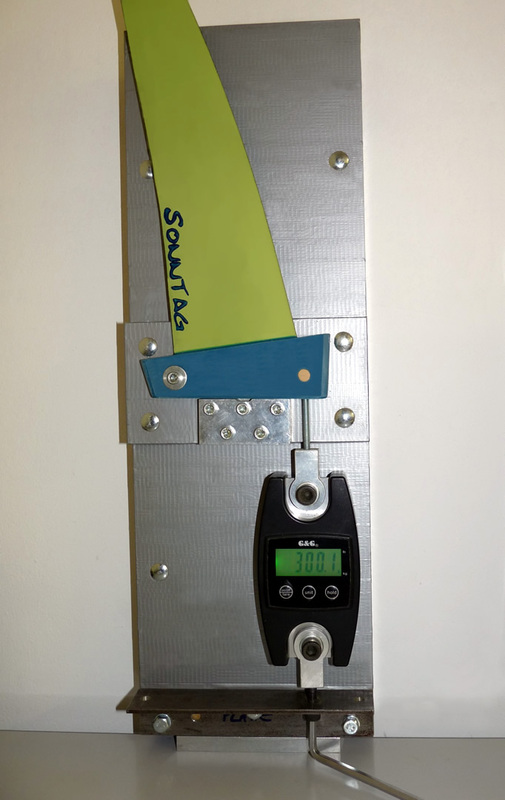 Therefore we designed the size and structure of the G10-elements in a way that they can break out of the fin base preventing the overload-stress of the box and board. For testing the best combination of base material and G10-element we developed and built a small test bench (picture on the right) allowing us to measure the effect depended on the load/forces applied.